From Third Cinema to Media Justice: Third World Majority and the Promise of Third Cinema, edited by Kara Keeling and Thenmozhi Soundararajan has just been released as an online Scalar publication. Third World Majority was one of the first women of color media justice collectives in the United States, operating from 2001 to 2008. From Third Cinema to Media Justice: Third World Majority and the Promise of Third Cinema is a collaborative multi-media archival and scholarly project. From Third Cinema to Media Justice brings together a comprehensive digital collection of materials produced by Third World Majority during the years of their existence along with scholarly essays, historical retrospectives, and dialogues about the work of Third World Majority. Readers can access the Third World Majority’s video collection directly by choosing “Archive” from the main table of contents and from there explore curriculum materials and best practices for teaching with this archive. By selecting “Dialogue” readers can browse a series of essays by activists, scholars, and cultural workers who draw on the archive to explore the history, ideas, and production models of this collective. Essays in this publication include “Introduction: Guiding Questions” by Kara Keeling, “Culture is a Weapon: Women of Colour Media Activism in the 2000s” by Carrie Rentschler, “’Take the Red Pill of Media Justice’: Third World Majority and Media Justice Activism​” by Lena Palacios, “Third World Majority as Feminist Online Space” by Alexandra Juhasz, and “Decolonial Media Praxis: From Cinema to Network” by micha cárdenas. 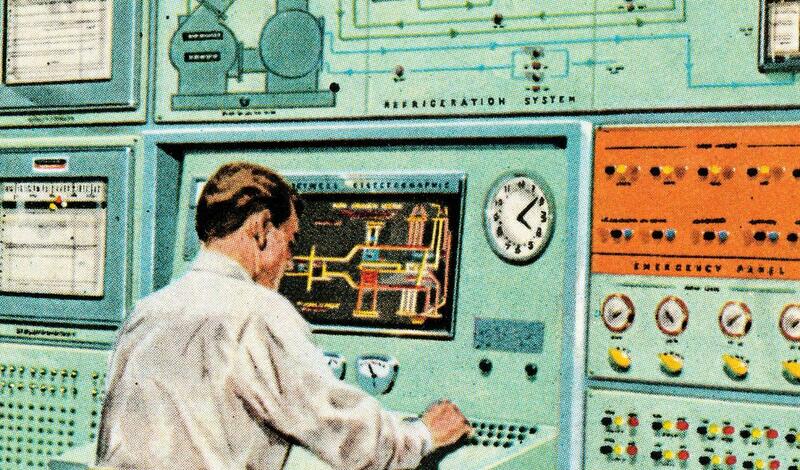 Anyone who’s edited a work of digital scholarship can tell you the task comes with a unique set of challenges. Some are practical (“How do I know if I’ve read the whole thing?”) while others are philosophical (“How do we handle changes made after publication?”). 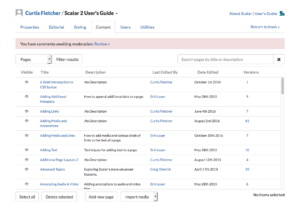 With the release of Scalar 2.5, the Scalar platform gains a new set of Editorial Workflow features designed to make the process of preparing a Scalar project for publication easier for authors and editors alike. 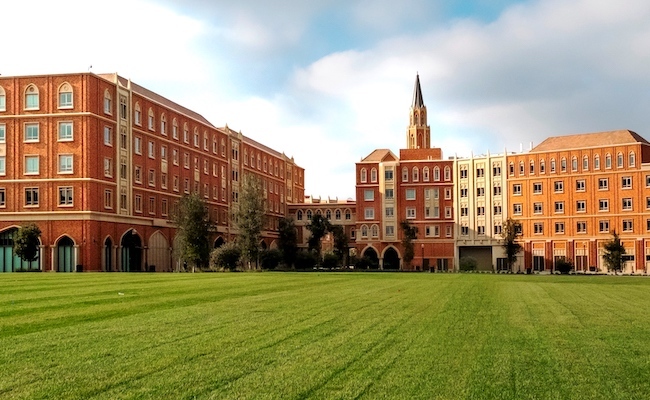 We’re excited to share these new additions with you! 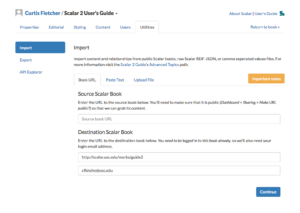 You may have noticed that Scalar’s new Dashboard includes an Editorial tab—which now includes the ability to activate the Editorial Workflow for a specific book. Once activated, the Editorial tab will become your headquarters for tracking the editorial review process. If you don’t need the Editorial Workflow, do nothing and your Scalar books will continue to function as before. 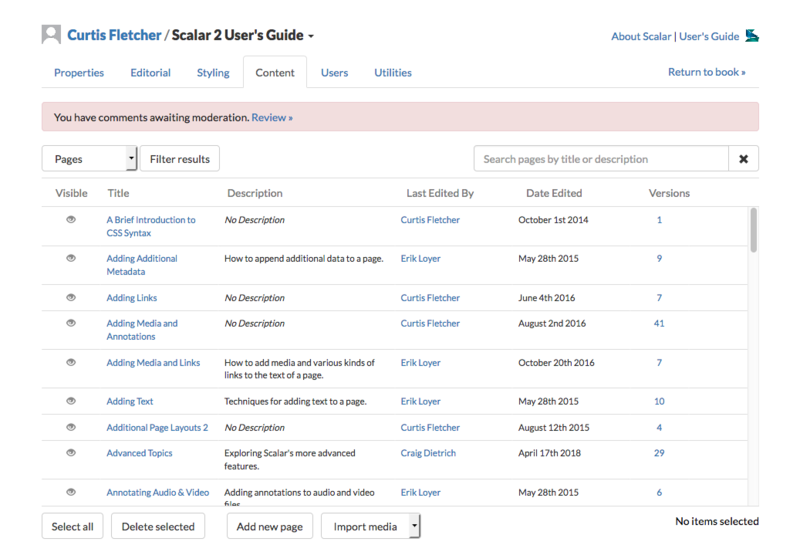 Under the Users tab we’ve also added a new Editor user role to Scalar to facilitate the Editorial Workflow. Authors and Editors will have different permissions and will be prompted as to their respective tasks while they guide content through a six step process with multiple opportunities for review, revision, and comment. 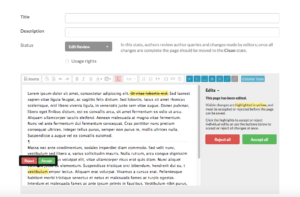 The Editorial Path is a new view in Scalar designed specifically to assist with the task of editing. It presents the complete content of a book in a scrolling format which can be sorted in several ways, helping ensure that nothing is missed. Inline editing allows authors to make text and media changes directly, without any need to navigate to individual pages. Search features and an outline view provide quick navigation throughout the book. The Edit Page now includes an integrated Version Compare feature which highlights changes between individual versions. 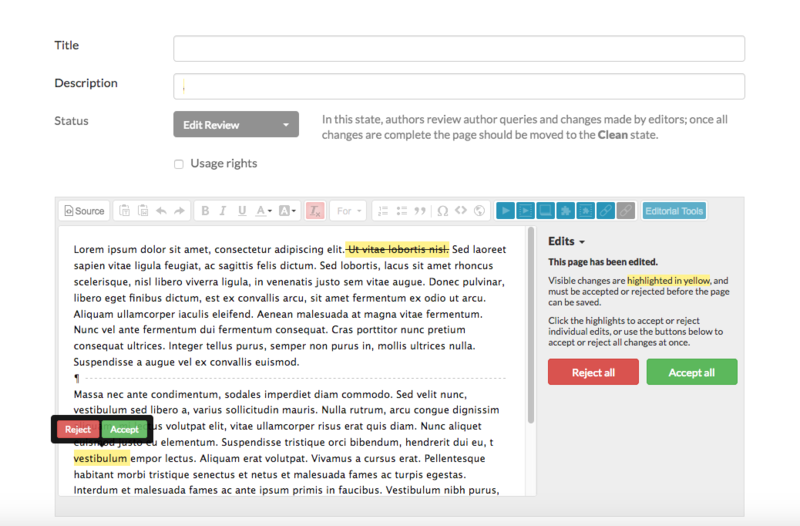 After an editor completes their review of a page, changes are automatically highlighted for the author, who is prompted to accept or reject the edits before proceeding. By default, once a book passes through all six editorial phases to the Published stage, any future changes made by an author will go live immediately. Scalar’s new Editions feature, however, makes it possible to “freeze” the text and metadata of a book at its current state as a named Edition. Future changes will be hidden from users until those changes have gone through the review process and are themselves published in a new Edition. Visitors will always be shown the latest edition by default, but can access past editions if desired. This is just an overview of the new Editorial Workflow features—for details, look to future blog posts or explore our updated documentation. Our thanks the National Endowment for the Humanities for making these new additions possible. Starting today, Scalar users will be able to opt-in to a simplified, streamlined Dashboard interface that aims to make Scalar books easier to work with, while also adding in a few new features. The new Dashboard features a set of tabs at the top, just like the existing version, but with some new twists and tweaks—read on for the details. The new Dashboard prominently shows your user name and the title of the current book in the top left—clicking your user name will open the Account screen, which contains the functionality that previously appeared in the “My account” tab, including the ability to create new books. Instead of a tab for each type of content in a Scalar book, the new Dashboard includes a single Content tab which can be filtered by content type. This new view is more readable and items can be selected and deselected more easily, by clicking the empty portion of any row. Options for customizing the look, feel, and behavior of your book have now been moved into their own standalone Styling tab for convenient access. The Import and Export tools have been moved to a new Utilities tab, along with the API Explorer, a tool which was previously available at a separate URL but which now has been rolled into the Dashboard. This streamlined version of the API Explorer will walk you through creating an API query from start to finish, and can even be used to calculate an approximate word count for your project. You can find more detailed information on the new dashboard in our User’s Guide. We hope you like the new Dashboard—if you have any questions or concerns, feel free to get in touch! 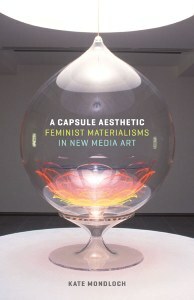 See A Capsule Aesthetic: Feminist Materialisms in New Media Art at the the University of Minnesota Press. 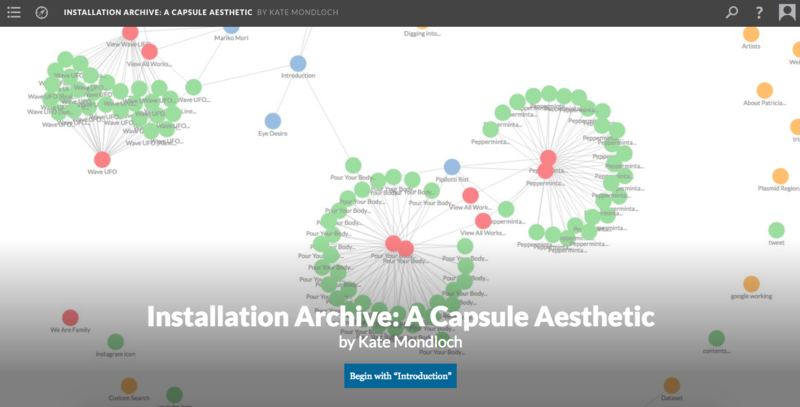 Check out Installation Archive: A Capsule Aesthetic. Give your Scalar Book a Little More Action! Using Videos in Splash and Image Header Layouts. Ever wanted to have a clip from a feature film play in the background of a splash page in your Scalar book? Or have animation in the header of a page? Now you can! Adding a full-screen film clip to the background of your landing page or to the headers of select pages can add visual action to your project and, in general, enrich the multimedia experience of your work. But up till now, users employing our Splash, Book Splash, and Image Header layouts (see below) were limited to still images. Now, each of these layouts also support videos with an MP4 file format. Videos added to these layouts will autoplay on a loop in the background without audio and without user controls. And as always, this new Scalar feature is fully mobile responsive. Splash Layout. In the Splash layout, the page’s key image or video is shown full screen, with the page’s title at the bottom. If the page is part of a path or is itself a path, a navigation button is shown as well. Book Splash Layout. In the Book Splash layout, the page’s key image or video is shown full screen, with the book’s title and author(s) at the bottom. If the page is part of a path or is itself a path, a navigation button is shown as well. Image Header Layout. In the Image Header layout, the page’s key image or video is shown as a header, with the title and description of the page overlaid. The rest of the page follows the Basic layout, with text and media interspersed. Comments Off on Give your Scalar Book a Little More Action! Using Videos in Splash and Image Header Layouts.